Iraqi Insurgency and the Jihadist Tet? For at least the last two years, government officials and military officers have shied away from comparisons between Iraq and Vietnam – with good reason. There are few parallels between the two situations. New York Times columnist Tom Friedman recently called the current violence in Iraq "the jihadist equivalent of the Tet offensive." I am sure the leadership – both civilian and military – at the Pentagon cringed when President Bush said that Friedman might be right. 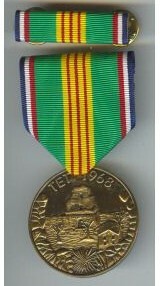 The Tet (lunar new year) Offensive of 1968 was a concerted effort by the Viet Cong and the North Vietnamese Army to strike a decisive blow at South Vietnamese and American forces. Militarily, it was a defeat for the North Vietnamese and effectively destroyed the Viet Cong as a fighting force. However, it created what military strategists call the “significant emotional event” that turned the tide of public opinion in the United States against the war and led to the eventual withdrawal of American forces from Southeast Asia. The creation of a “significant emotional event” is an acknowledged tactic for an insurgency, along with attempts to influence the media. Most successful insurgencies do not succeed on the battlefield – they succeed in the national psyche of the occupying country. - the bombing of the Marine barracks at Beirut airport in 1983 by Hizballah in which 241 American servicemen were killed. Less than four months later, President Reagan ordered the Marines to withdraw. - the battle in Mogadishu, Somalia in which 18 Army Rangers were killed in a day-long firefight with forces of guerilla leader Mohamed Farrah Aidid. Although the raid technically achieved its objectives, the loss of two helicopters and the mistreatment of the bodies of American troops caused President Clinton to withdraw the troops a few months later. Foreign militaries and insurgents alike took note of these events. Prior to the American-led invasion of Iraq in 2003, Saddam Hussein provided copies of the book Blackhawk Down (which chronicled the Mogadishu battle) to his senior commanders. Knowing full well his forces could not effectively fight American troops force-on-force, he believed that using such tactics might either delay the battle long enough or cause enough American casualties to achieve some negotiated settlement. President Bush, his spokesman Tony Snow and Multinational Forces-Iraq spokesman Major General William Caldwell have all stated that they believe the timing of the increase in violence is not coincidental. All three have commented that the insurgents may be trying to influence the upcoming U.S. elections. It could be – we have seen numerous examples that the insurgents, be they Iraqis or foreigners, are well versed in the American media’s impact on public opinion. They may be increasing the level of attacks on American forces – this has been the bloodiest month for U.S. troops in two years – rather than attacking each other. Their likely goal: creating that significant emotional event that will either turn American public opinion against the war or influence the upcoming election, or both. Lt Col Rick Francona is an MSNBC military analyst and a veteran of both the Vietnam and Persian Gulf wars. Insurgent Parades in Anbar Governorate? On Friday, the Muslim holy day, Iraqi insurgents staged military style parades in several cities in volatile Anbar Governorate, including the city of Al-Hadithah. Several of these were near to U.S. military bases. This follows a similar parade in Ar-Ramadi (capital of the governorate) on Wednesday. The Iraqi government is either incapable or unwilling to act forcefully to put down this violence and the defiant shows of force. They have got to start or they have rendered themselves irrelevant and a civil war in inevitable. Where are the American forces? How can a band of insurgents brazenly parade through cities brandishing automatic weapons and rocket-propelled grenade launchers? Get out of your garrisons and start killing these people. This is an addendum to my earlier piece, "Iraqi prime minister and the militias." The Associated Press reported today that the 800 members of the jaysh al-mahdi (Mahdi Army) had taken over the southern city of Al-'Amarah (read story), in direct defiance of the Iraqi government. The militia members destroyed local police stations, set up checkpoints in the city, began armed patrols of the streets and ordered residents to remain indoors. British forces pulled out of Al-'Amarah in August. Since then, the Mahdi Army has tried to enforce adherence to Islamic law. The Mahdi Army is the militia associated with radical Shi'a cleric Muqtada As-Sadr. Iraqi prime minister Nuri Al-Maliki dispatched a delegation to negotiate the situation in the city. If he handles this like he has dealt with other militia activity, especially that of As-Sadr's Mahdi Army, not much will happen. If he is not willing to use Iraqi security forces to restore order, this will happen in other cities, and the spiral toward civil war will accelerate. There was a news story reported by the Associated Press today that concerns me. 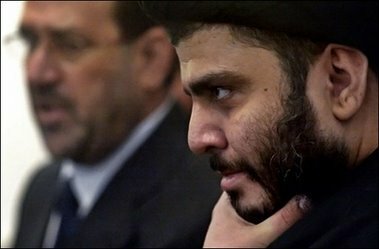 "Iraq orders US to release Shiite activist" details the release of a senior member of Muqtada As-Sadr organization at the "order" of Iraqi prime minister Nuri Al-Maliki. According to the story, Shaykh Mazin As-Sa'di was detained by American forces in the heavily Shi'a Al-Kazimiyah section of Baghdad. A spokesman for As-Sadr claimed that the shaykh was arrested to provoke his jaysh al-mahdi (Army of the Mahdi) militia in to an armed confrontation. He further said it will not work because As-Sadr has counseled restraint. As well he should - the last time he tried an armed confrontation with U.S. forces (May 2004 in An-Najaf), his militia was decimated. What is more disturbing is the prime minister's reluctance to confront any militia in general and the As-Sadr militia in particular. This further plays into the Sunni disdain for Al-Maliki, who they openly refer to as "the Iranian." Al-Maliki is a devout Shi'a and a member of the Dawa' party, pro-Iranian Shi'a hardliners. As far as militias in general, he openly disagrees with the commander of U.S. forces in Iraq, General George Casey. Casey is on record that the militias - all militias - must be disbanded. He has relayed that belief to Al-Maliki where is seems to have fallen on deaf ears. Casey claims that Al-Maliki understands that the militias need to be disbanded, just not now. Based on my experience with the Iraqis (and Arabs for that matter), this bukrah (tomorrow) attitude is in essence a "no." This is troubling. Many observers believe that the As-Sadr militia is one of the main factors in the increasing sectarian violence that threatens to plunge Iraq into an all out civil war. American forces are being caught in the crossfire, as well as possibly being directly targeted by these Shi'a hardliners. In the past, Al-Maliki has bristled following American raids into Sadr City, a strong hold of the Jaysh Al-Mahdi, at one point apologizing for such a raid and promising that it would not happen again. Meanwhile, Baghdad remains a sectarian battleground. It's time for Al-Maliki to start being part of the solution instead of part of the problem. Otherwise, he has to go. On November 5, the Supreme Iraqi Criminal Tribunal will publish the verdict of the first trial of Saddam Husayn; sentencing will occur at the same time. Saddam and his seven co-defendants could be sentenced to death by hanging for the murder of 146 Shi'a Iraqis in the town of Ad-Dujayl following an assassination attempt there. Saddam's co-defendants include his half brother Barzan At-Tikriti, former chief of the Iraqi Intelligence Service. As the publishing of the verdict approaches, violence directed at the court and prosecution continues. The brother of the top prosecutor in Saddam's second trial was murdered in front of his wife at his home in Baghdad on October 16. This comes just two weeks after the brother in law and nephew of the judge in that same trial were murdered. While awaiting the results of the first trial, Saddam and six co-defendants are being tried on charges of crimes against humanity, specifically the killing of thousands of Kurds in the Anfal campaign during the Iran-Iraq war. This violence is an attempt on the part of the insurgency - specifically former regime elements - to intimidate the prosecution of the former Iraqi leader. As the November 5 announcement of the verdict, which most observers expect to be "guilty," violence may escalate. If Saddam is found guilty and sentenced to death, there may be a spike in insurgent activity. 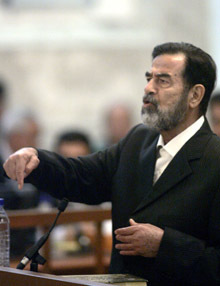 As he waits to be found guilty - at some point one of the charges will stick - Saddam is not going quietly into the night. In a letter released via his lawyers (including the despicable American Ramsey Clark - see my earlier comments on that), he urges Iraqis to disregard sectarian differences and unite in forcing American forces out of Iraq. Claiming that victory was close at hand, he signed the letter as the president and commander-in-chief of the "holy warrior armed forces." Since Saddam's main accusers are the Shi'a and Kurds - together about 80 percent of the population - that suffered so badly under his rule, I wouldn't put much stock in his prediction. In the blessed month of Ramadan, there is good news from The Land of the Two Rivers [Mesopotamia], the land of the caliphs, from Baghdad, the capital of the caliphate - may Allah free it from the Crusaders and the Shi'a. The fruits of the monotheism tree, irrigated with the martyrs' blood, has ripened and it is time for the harvest. We are united, and the mujahidin bring good news to the Islamic nation everywhere, especially to the Sunnis in Iraq, about the foundation of the proper state, an Islamic state which will rule the land and people with Allah's law which will protect the Sunnis in Mesopotamia. The media committee has the honor to present to all Muslims everywhere the message of the establishment of the Islamic State of Iraq in the Iraq in the name of the Ministry of Information. We invite all Muslims in the world to support this state with money, men and prayers. There are some key phrases in this announcement. They refer to the caliphate, an Islamic governmental structure tying religion and the state into one entity. Further, they reference "Allah's law," which means the imposition of the Sharia', strict Islamic law. Note also the desire to rid Baghdad of not only the Crusaders (the U.S-led coalition), but the Shi'a as well. This is a state for the Sunnis. Given the chosen name of the new state, the Islamic State of Iraq, I am of the impression that this structure is not within the constitutional provisions of autonomous regions, but an actual independent country. Declaration of "Islamic Iraq" - precursor to civil war? The Al-Qa'idah led Islamic insurgent umbrella organization Mujahidin Shura Council announced that it has established an Islamic Iraqi state comprising four governorates and portions of two others. The area consists mainly of the Sunni areas of the country, and the capital city of Baghdad. It also includes areas that are inhabited by Kurds and Shi'a Iraqis. It is this provision that has been fully exploited by the Kurds, who have established the Kurdish Regional Government. They have gone so far as to direct that only the Kurdish flag will be flown in the autonomous region, have established an airline and, contrary to the constitution, negotiated oil deals with European oil companies. There are indications that the Shi'a are contemplating doing the same thing. The one thing that concerns the Sunnis is the oil revenue issue. Both the Shi'a and Kurds want to control the oil resources in their areas. That means that the Shi'a (60 percent of the population) would control about 80 percent of Iraq's oil, and the Kurds (20 percent of the population) would control the remaining 20 percent. That is why "Islamic Iraq" claims Kirkuk with its huge oil fields. Sectarian violence has been on the increase since the February 2006 attack on the Al-'Askari mosque (also called the Golden mosque) in Samarra'. The three major factions - Kurds, Sunni and Shi'a - have been staking out their positions for what many believe is the inevitable civil war. Unless the government of Nuri Al-Maliki can secure the country, it will ultimately devolve into anarchy and civil war. Given the government's inability to even secure Baghdad, that possibility is looking more and more likely. 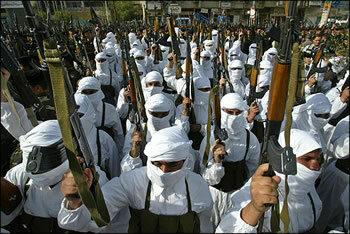 Islamic Iraq - the Sunnis - are probably in the worst position should an all-out civil war erupt. The Kurds have virtually autonomous since 1992, are fairly self-sufficient and fiercely independent. They are capable of defending their territory against the Sunnis, the Shi'a or both. The main area of contention will be their unwavering demand that Kirkuk be part of their area. Kirkuk under Saddam Husayn was "Arabized" - Kurds were moved out and replaced by Arab Iraqis. After the fall of the regime in 2003, the Kurds have been removing the Arabs and Turkoman - sometimes by force. This ethnic cleansing is taking place in neighborhoods all over Iraq. What happens if there is a civil war? The Kurds will probably declare themselves to be independent. This runs the risk of intervention by Turkey, who along with Iran and Syria have stated that an independent Kurdistan is unacceptable. Turkey is concerned that its Kurdish minority will want to do the same, possibly joining the new state. Of course, the Iraqi Kurds' use of the term "southern Kurdistan" to describe northern Iraq does nothing to assuage Turkish concerns. The Shi'a and Sunni will be the main antagonists. What may happen is intervention by the Iranians on the side of the Shi'a, and the majority Sunni Arab countries - such as Jordan, Egypt, Saudi Arabia - may intervene on the side of the Sunnis. Regional conflict might ensue between the Arabs and the Iranians/Persians. What of the American forces? They are the only thing preventing a full-blown civil war now. If it happens, the United States will have no choice but to withdraw and let it happen. As an old colonel once told me, "Sometimes you have to let the train crash to build a railroad." On October 13, the head of the British Army made some remarks that have caused quite a stir in the United Kingdom and the United States. General Sir Richard Dannant, newly appointed chief of British army general staff (BBC profile), stated that the presence of British troops in Iraq was exacerbating the insurgency in Iraq and problems around the world, and that the troops should be withdrawn "soon." He went on to say that the effort to bring democracy to Iraq may be naive. "I don't think we are going to do that. I think we should aim for a lower ambition," he said. Fine, Sir Richard. Many in your country and army agree with you. Many in the United States feel the same. While some view your candor as refreshing - candid remarks from not just a serving officer, but the chief of the British army - you may have put your troops in greater danger. I am sure that was not your intent, but your words were picked up immediately by the Iraqi insurgent website Press Release (read the article), "...lies and media tricks prove the critical situation of the crusader alliance in al-Rafidayn land [Mesopotamia] , especially after the calls of leaving Iraq announced by the British army - the principal ally in the crusader alliance - , which is a threat for the alliance contract . The whole world – by Allah willing- will hear soon about good news...."
If I were the leader of the insurgency or a militia group that wanted to create greater problems, I would now focus my attacks on the remaining 7,000 British soldiers in southern Iraq. The insurgents sense a weakness - they are bound to exploit it. "We have been in Southern Iraq for three and a half years and we have made significant progress, with two of the four provinces now handed over to Iraqi control and our responsibilities are much reduced in one other province. The point that I'm trying to make is the mere fact that we are still in some places exacerbates violence from those who want to destabilise Iraqi democracy. "Currently Operation Sinbad is trying to make Basra better and a lot of British soldiers are doing a really good job. In that regard, their presence is helping but there are other parts where our mere presence does exacerbate and violence results. "But that is not a reason for us to leave. I am on record publicly saying we're standing shoulder to shoulder with the Americans. I am on the record from a speech three weeks ago saying that I'm planning force packages in Iraq through 2007 in to 2008. I'm a soldier - we don't do surrender, we don't pull down white flags. We will remain in southern Iraq until the job is done – we're going to see this through." Fine, but the genie is out of the bottle, the damage is done. "No wonder US Lieutenant Rick Francona noted indifferently in a report to the Pentagon that the Iraqis had drenched Fao in gas when he visited the battlefield during the war." Overall, it's worth a read - it's long (6,770 words). Fisk has the reputation of knowing his way around Middle East topics, albeit a bit to the left. He has lived in Beirut for the last 25 years and speaks good Arabic. I just wish he wouldn't put words in my mouth. Israel: Is There a Peace Process Anymore? Good question. I think the answer, regrettably, is no. At one time in my career dealing with Middle East issues, I was optimistic. Optimistic and probably naive - most of my time I spent dealing with Syria, Lebanese, Jordanian and Iraqi issues. By default, much of that involved Israel. During my involvement, we have seen agreements between Israel and Egypt, Jordan and Lebanon (although this was later abrogated through Syrian intervention). While I was the air attache at the U.S. Embassy in Damascus (1992-1995), we were very close to brokering an agreement - unfortunately those days have passed. Since the Palestinian elections of January 2006 in which the Islamic Resistance Organization (HAMAS) won control of the government, the question has been, "Will Hamas recognize Israel?" Hamas, regarded by the United States as a terrorist organization, has consistently refused to recognize Israel's right to exist. This has led to almost complete isolation of the group by the Western world. There have been several attempts to come with a workable solution to the impasse, some way in which the West can support the elected government of the Palestinians. No matter the wording or machinations, the bottom line is that Hamas will have to recognize Israel. None have worked. At some point, the "peace process" has come to a screeching halt. I think there is no doubt that Hamas has been emboldened by what many to perceive as Hizballah's victory over the Israelis in "The Sixth War" this summer. 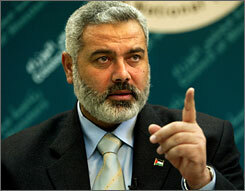 Whether correct or not, Hamas is now of the belief that they can stand up against the Israelis. When, they might say, is the last time you heard anyone ask about Corporal Gilad Shavit? At some point, the Israelis will have had enough with Hamas in the Gaza Strip. The Israel Defense Forces are looking to regain their fearsome reputation, and Gaza does not have the privileged status in the West that Lebanon does. I think Hamas is playing a dangerous game. According to Janes Defence Weekly (read article), Syria and Iran have expanded their joint signals intelligence (SIGINT) collection efforts, increasing the number of joint intercept sites from two to four. 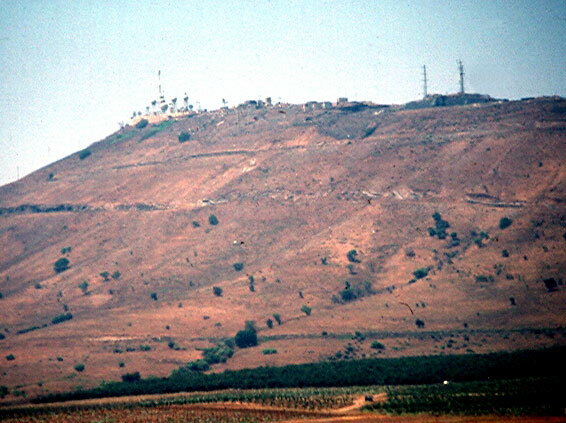 The two existing sites, one located near the Israeli-occupied Golan Heights and the other located in northeast part of Syria are in excellent location to intercept communications of Israeli forces in Israel and American forces in Iraq, respectively. Of course, the site near the Golan Heights was likely of immense value to Iran's Islamic Revolutionary Guard Corps (IRGC) efforts to support Hizballah with weapons and intelligence on Israeli forces during the recent conflict in Lebanon. The two new sites will be located near Bab Al-Hawa' in the mountains near and overlooking the Turkish border, and near Abu Kamal, where the Euphrates flows from Syria into Iraq's Anbar province, the site of the fiercest fighting between Iraqi insurgents and American forces. According to the article, these sites will complement IRGC intelligence collection capabilities. As Iran emerges as the leading power in the region, they need accurate and timely intelligence on their neighbors. Syria is willing to provide them a platform to do just that. This expanded cooperation comes in the wake of, and probably because of, a defense cooperation agreement proposed in February 2005 and signed last November. (See my earlier Syria and Iran Common Front - Nothing New) Syria and Iran have been allies since Damascus sided with Tehran during the 1980-1988 Iran-Iraq war. Of course, Syria and Iran are not the only ones collecting signals intelligence in the area. 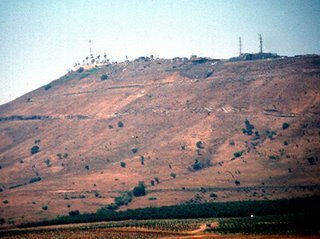 The Israelis have a huge SIGINT collection site in the Golan Heights (see photo at right). On the Syrian side, the SIGINT effort is under the control of Syrian Military Intelligence. Most people are not aware that women serve in the Syrian military, in the medical and administrative fields as you would expect, but mostly they serve in the signals intelligence directorate. 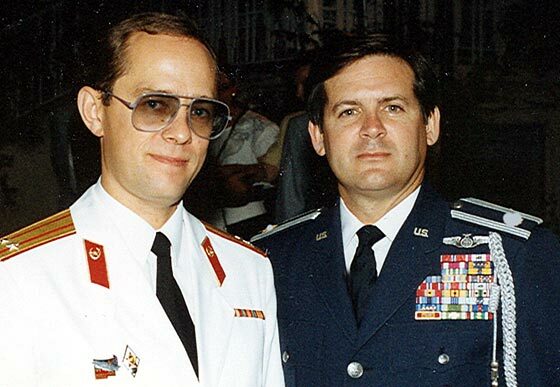 When I was the Air Attache at the U.S. Embassy in Damascus, we attaches were invited to the graduations of all the service academies. On the airport road in Damascus is the Al-Kuliyat Al-'Askariyah Lil-Banat, The Military College for Girls*. Upon completion, they are commissioned as second lieutenants. There's just something about a 21-year old dark-eyed Syrian girl/woman in fatigues with an AK-47, but I digress. While chatting them up at the reception at the Officers Club following their graduation - it was pretty easy, they all wanted to have their pictures taken with Al-Amirki (the American), since we are, after all, the bad guys. They told me that almost all of them had been studying Hebrew for four years and were going to be intercept operators. This expanded cooperation beetween Iran and Syria should come as no surprise. * "Girls" is the actual translation, rather than the expected "women."